Councillor Davie Paterson in Rosebank Road. Motorists travelling at “stupid speeds” are putting the lives of youngsters on a stretch of road in Hawick at risk, a town councillor has warned. Davie Paterson, an independent member for Hawick and Hermitage, has been contacted by concerned residents at the Loan and up to Rosebank Road. They claim passing drivers are regularly flouting the 30mph speed limit there. Mr Paterson said: “One constituent told me that some of the cars were travelling at what they called stupid speeds. “The speed limit is 30 mph, but I have been told that some cars are travelling way in excess of that. 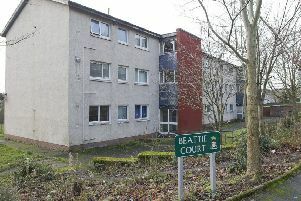 Mr Paterson raised his concerns in a recent meeting with Hawick police inspector Carol Wood, and she has promised to look into the matter when resources are available. It’s the second time in recent weeks Mr Paterson has highlighted safety concerns over the town’s roads. Worried residents in Renwick Terrace had approached him over speeding traffic there, close to a children’s playpark, with claims that vehicles were travelling “significantly higher” than the 30mph speed limit. Late last year, Mr Paterson also highlighted the fears of anxious residents of Liddesdale Road over speeding motorists.